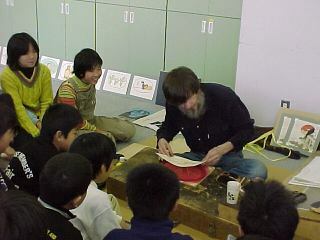 One day this spring I was invited by Mr. Harada, the art teacher, to visit Shorin Elementary to talk to the Grade Five classes, and to show them something about woodblock printmaking. The kids were of course happy to get out of their normal classes, but didn't quite know what to expect when they came into the room. 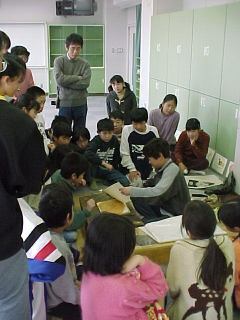 They soon found out that it wasn't time for a 'lecture' - it was time to have some fun making prints! 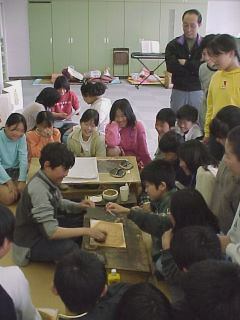 I started off by sitting them down in a circle around my workbench, and making a 4-colour print while they watched. (There was no time for carving of course, this was just printing ...) We joked and laughed as we went through the process, and I made sure that they watched carefully - because they knew that their turn was coming next! The design of the print was a simple image taken from a folk tale - something that they would all recognize. Once I was finished, it was their turn ... For the first one up, I sat beside her and gave a bit of advice, but she really didn't need my help - the other kids were quick to point out the procedure. ... then I left them alone to it ... And you know what? They did fine. 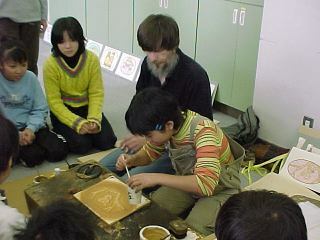 Woodblock prinmaking isn't really such a complicated procedure at all, and once you've seen it done properly - that's all you need! I wish I had more time for events like this - the kids are always very responsive and so happy to see the pictures created right in front of their eyes. I doubt that many of them will become printmakers, but at least now they know what a woodblock print is!